A streamlined and lighter helmet designed less for ballistic and more protection for high specific units like paratroops units that need mobility and speed to work. It features a dual layer system of dense shock absorbent foam and padded cushions to provide a comfortable and safe fit for wearers. While its ventilated design makes wearing this helmet for long periods of time a breeze. 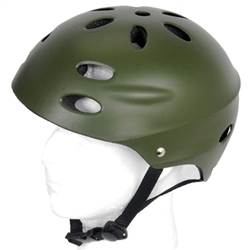 That helmet can be worn and secured with a set of retention straps that can be adjusted to fit any head size.